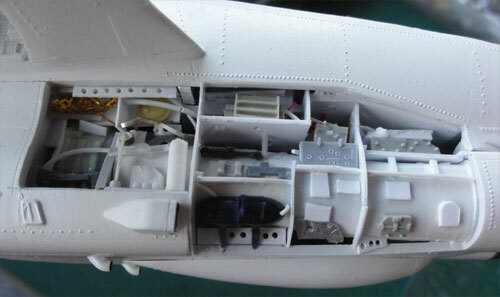 The opened up systems bay was detailed from scratch using bits and pieces of card and plastic. photos of the walkarounds were used. 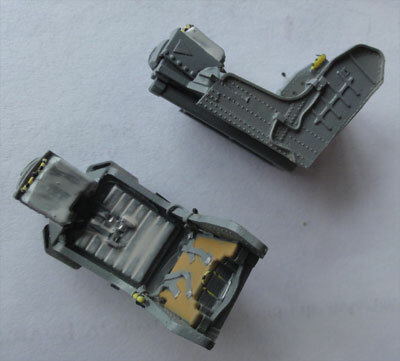 The bay will get a base coat of green as well as the opened up insides of the hatches, using Revell Aqua 364 acrylic. 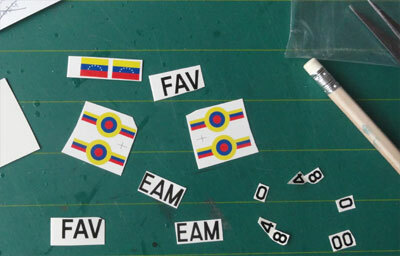 I made the Buckeye of the EAM: ESCUELA DE AVIACION MILITAR DE VENEZUELA. 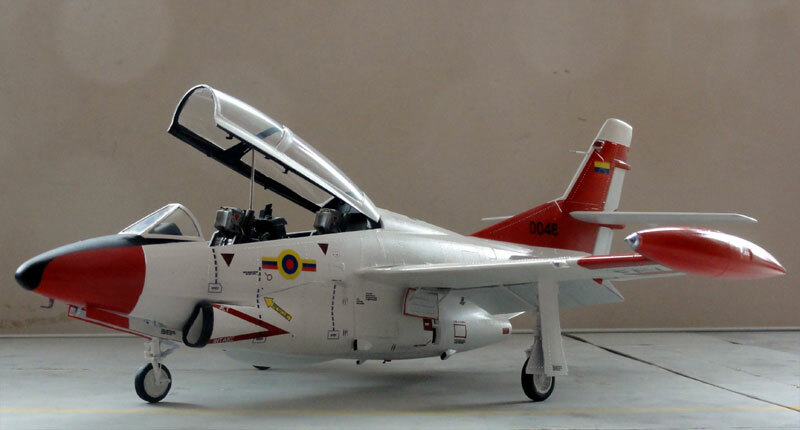 For the T-2D of the FUERZA AEREA VENEZOLANA , as when it was first used after delivery with the FAV roundels and flag, I had a very rare AZTEC decalset G-004 / 48022 with various markings and titles for the FAV. Strangely, finding actual photos of the FAV T-2D on the Internet proved to be difficult! I had searched and presumably later the scheme was changed because of the the new government regime? 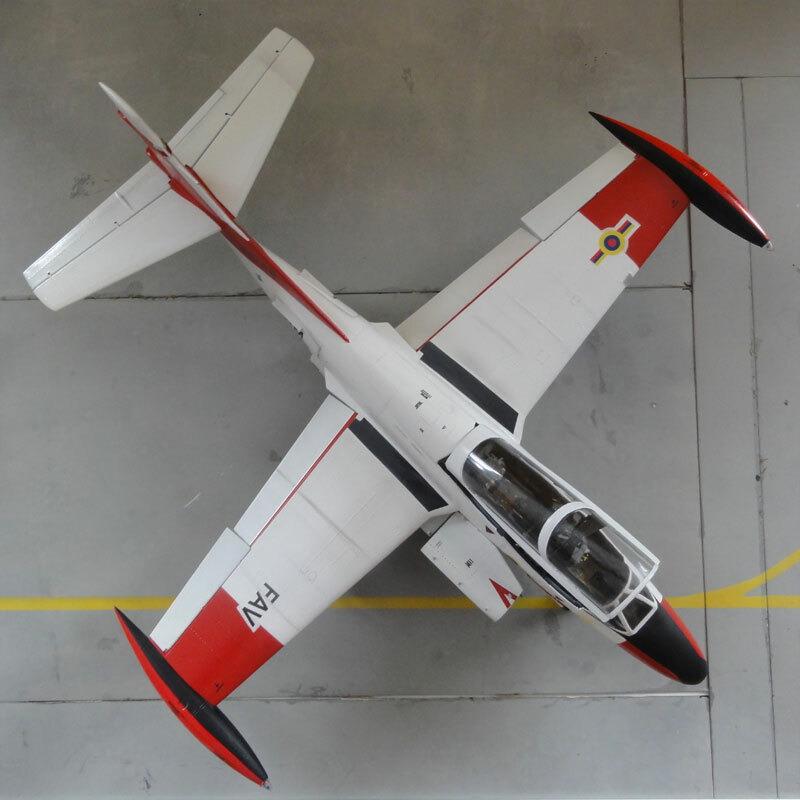 The scheme made is for a T-2D after delivery to the FAV. The details of FAV T-2D e.g. stencilling remains unclear. I assumed that after delivery from the USA personnel was trained and American texts (not Spanish) were retained. The RESCUE arrow was kept ("RESCATE" in Spanish). So I used a mix of kit decals but also did not use all stencilling as in the kit as these are not clearly seen on photos. The DANGER on the intake triangles (#24 and #25) were cut-away. Only a few NO STEP decals were used, decal #19 on the exhaust pipe and decals #16 and #17 were reversed. (Luckily the above decals could be found on the AZTEC sheet). The registration code of plane "0048" was used. These aircraft numbers were found on a Dutch Decal sheet set 72031 (those numbers on the AZTEC sheet are either too small or too large). There appears to be a small very dark grey/black walkway at the upper wing root. This was made from a sprayed over black spare decal. The engine intake lips have a black edge inside and outside. This was brush painted by hand. 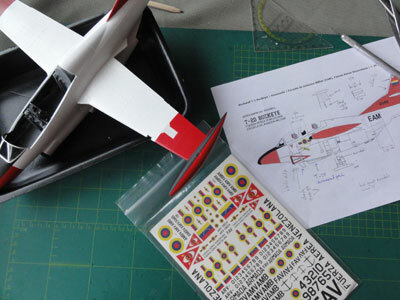 The Special Hobby kit decals are VERY thin so take care when applying them! The intake WARNING triangle was a bit adjusted for the FAV. 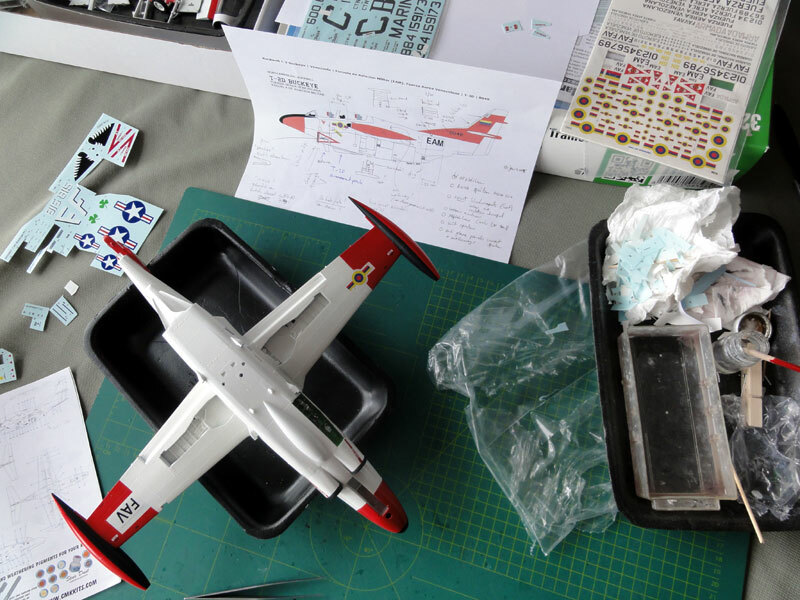 When the decals including the stencilling were applied and dried, with the airbrush very subtle "overspraying" was done with again white over some of the decals. This gives a realistic "blended in effect". Some white with a few drops of black was also sprayed along edges e.g. 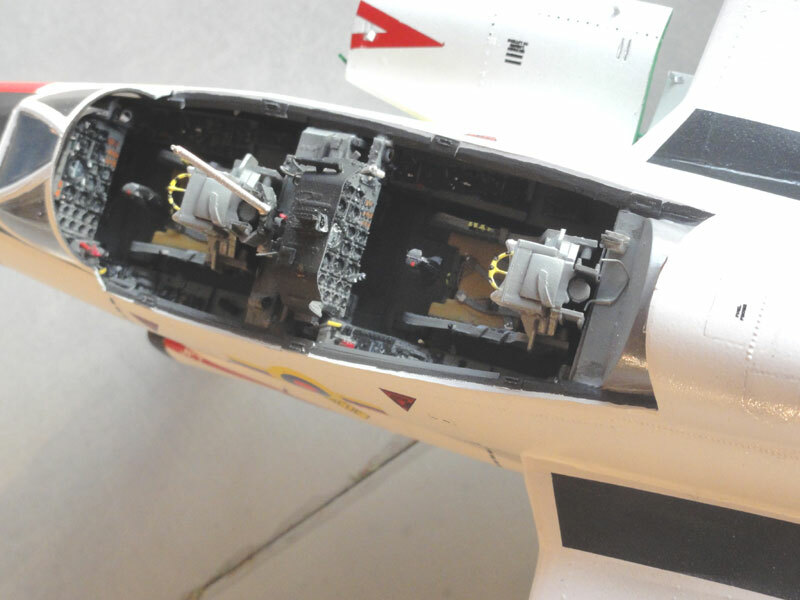 airbrake gaps, ailerons , cockpit step hatches etc. 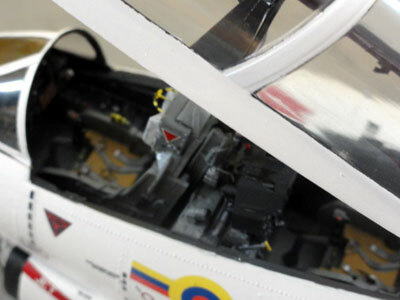 This gives a slightly weathered look but please note that these training aircraft were usually kept in good condition! The big wing flaps and ailerons fit OK but there is no clear indication how. I used bits of plastic rod to suggest their actuators and did not use the tiny kit parts (#H9, H16, H19). 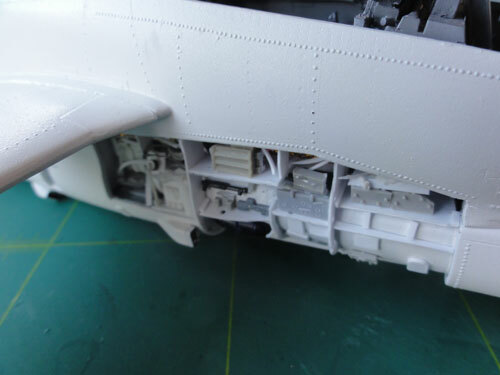 The undercarriage legs were fitted. There are no strong holes to fit the legs in. I used superglue and made "bended" edge metal strips to glue in the corners with superglue; paint white when dried to get much stronger joints. Main detail is white. 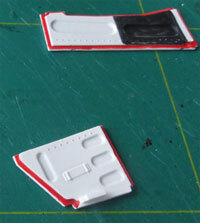 The door edges are usually "red" using Revell Aqua 330 "feuerrot" acrylic. Notice that the big doors have a black panel inside as indicated in the instructions; this was painted. Fitting the kit doors and their alignment is a bit unclear. The inner doors #G7, G9) fit onto the legs. I used a bit of plastic rod to get a vertical fit. I removed 1 mm of the height of the larger doors G6+G8 at the upper edges next to the legs. The door retraction rods (resin PUR7,8,9,10) look odd but are indeed well seen on a Buckeye. Nice detail! Inside the main gear wing bay wells a few white plastic rods were added as well for detail, but there is not a lot of detail seen in the real Buckeye gear wells. 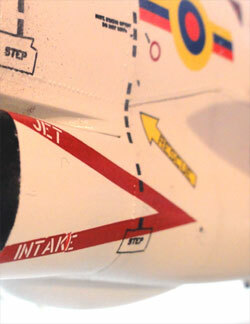 The nose gear leg has no clear location; bit of plastic and rod were used to fit the nose gear. 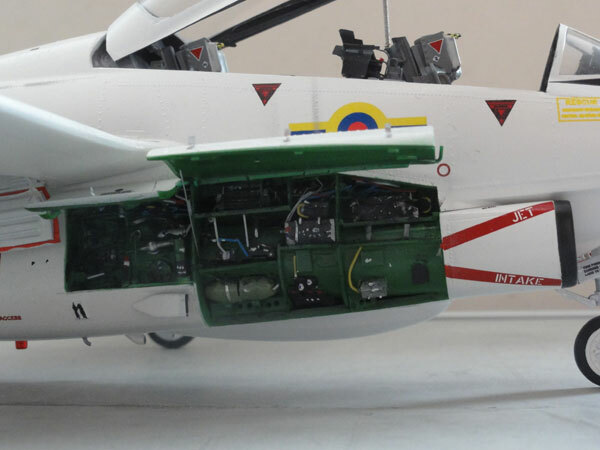 Note that the nose gear doors have a gap between the door and the fuselage as on a real Buckeye. The kit parts for the rods and actuators are very nice! 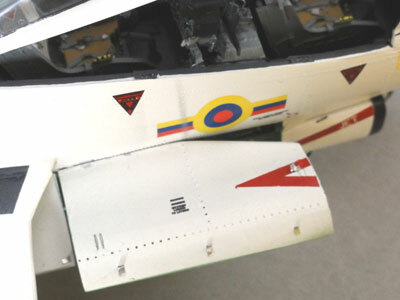 - the tail anti-collision lights #CP6+CP7 needed considerable trimming to fit; remove plastic and paint transparant red and blue (using e.g TAMIYA paints X23 and X27). - the anti-collision red transparant lights are in the kit and fitted as well e.g. #CP4 in STEP 28 and #CP7 in STEP 35. 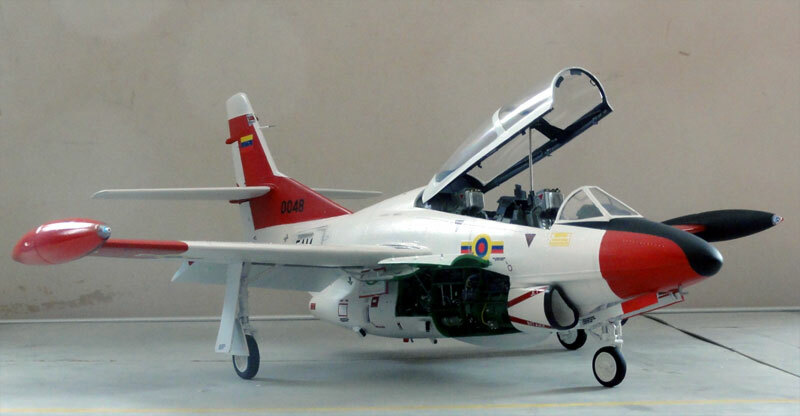 - the arrestorhook was NOT required for the Venezuelan T-2D! (I remembered this later). - no further pylons were installed. 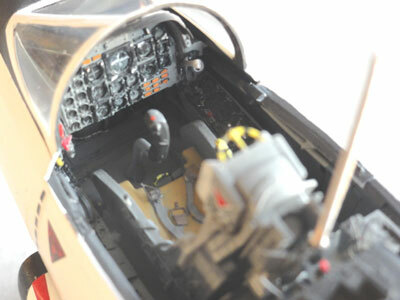 Cockpit sills/ edges were also detailed with card. 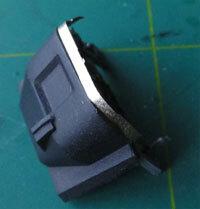 The canopy lock gaps were also suggested and made from very thin plastic card. The front instrument cover (part #C2) front edge is a bit too narrow. I added a metal strip that will be painted black. 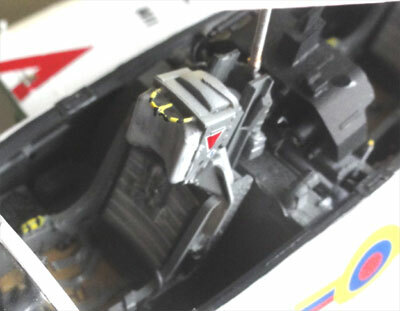 The LS-1A type seats are nice of the kit and further painted. Also, from some spare etched metal sets, some harness buckles were added. 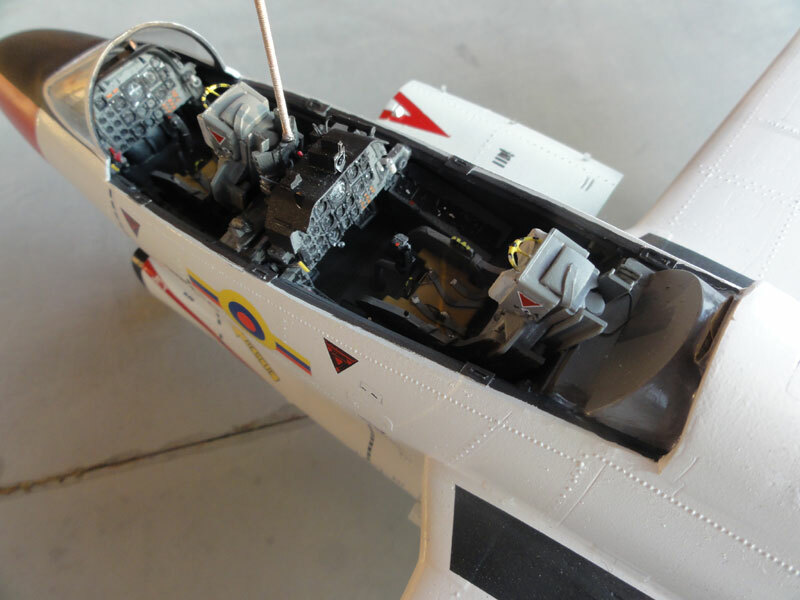 But the nice resin seats sit "too low" on the cockpit tub floor when looking at a closed canopy. I added 2 mm of rod below the front seat and 4 mm rod below the rear instructors' seat. This raises the seats and it looks better. The canopy itself (after being painted outside and inside as seen on page 3..... ) got internal frame details made from card and bits of old fasion "photo' edge negatives" for the locks. Note that the locks left and right are not symmetrical on the real canopy. 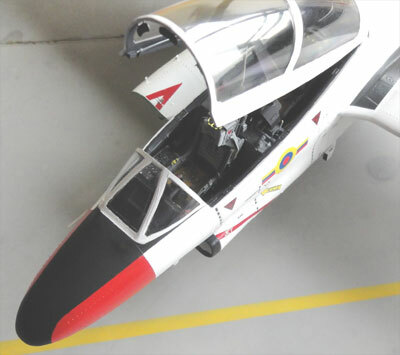 The canopy "V" shape kit part #H59 is too wide and too high. I removed the base-ends and bended the "V" a bit more flat. The rear canopy cover plate #H34 seems a bit too large, it was reduced 3 mm at its base. 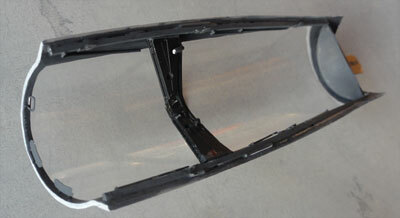 In order to make the canopy fit and detachable, a piece of metal lip was used and glued to the rear of this plate. 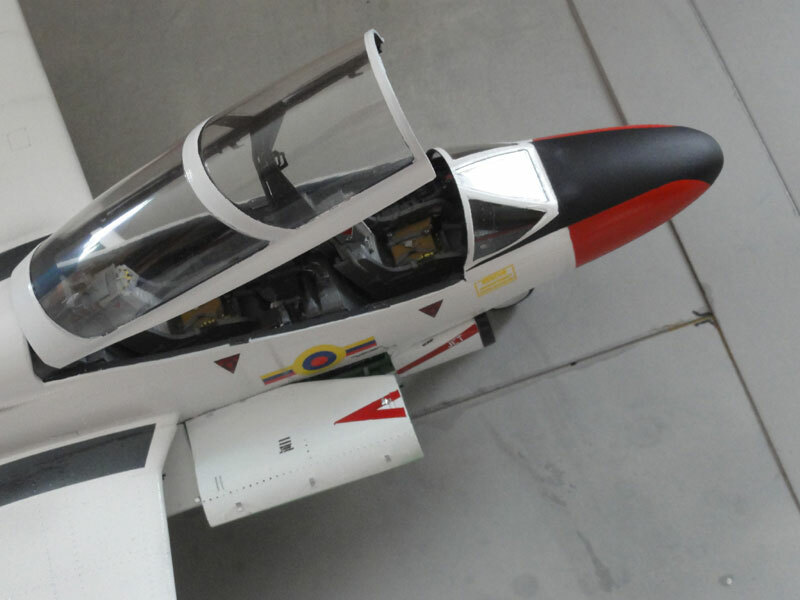 It fits into a scrap made slot at the cockpit fuselage "end". From a REHEAT MODELS mirror set two (not 3!) rear view metallic mirrors were fitted inside the front canopy edge. They are not set symmetrical! The canopy inside details were painted very dark grey. The canopy actuator "spindle" (of part #H4) was replaced; it was made a bit longer (26 mm) of a metal rod. Thin copperwire was turned on the rod to suggest the screw thread and painted metallic. 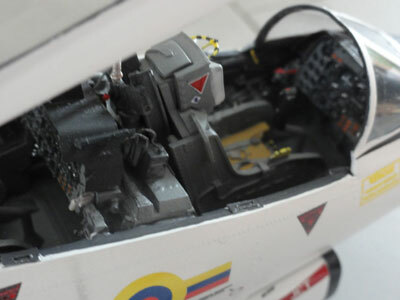 Next, the cockpit inside got very tiny detail parts like some small handles and pull levers. It was done as a last step as they are very vulnerable. 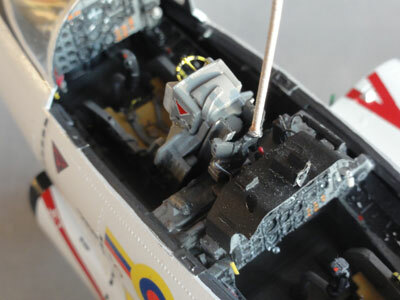 Finally, a couple of gloss varnish coats were airbrushed over the model (but not over the semi-matt antiglare panels). Johnson Future / Pledge was used, thinned with 25% pharmacy alkohol. This gives a nice shine and protects the decals. That completed the cockpit and the T-2D model!! In Venezuela military aviation started with the Air Academy in 1920 with some French Caudron aircraft and Breguet aircraft. In the 1930's a first base was established at Boca del Rio and aircraft purchased from France, England and the United States. Venezuela had larger oil fiels important for the Allied War Effort. During the Second World War more US support was obtained and locally in the Caribbean Sea German submarines on some occasions attacked oil tankers and ships. 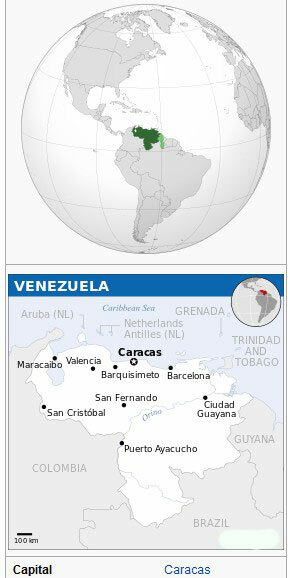 The Fuerza Aerea Venezuelana (FAV) was formally established in October 1947. Also transport aircraft were used and aircraft like the Venom, Vampire, Canberra and F-86 Sabre. Politics were not always stable and meanwhile many air bases were established aircraft deployed. Forces were strengthened also because of fears on Communism propagated in Cuba. Venezuela exported large amounts of oil so financing was not an issue. Aircraft like Mirages V, and Northrop CF-5 arriving from 1972 and OV-10 Broncos were bought. 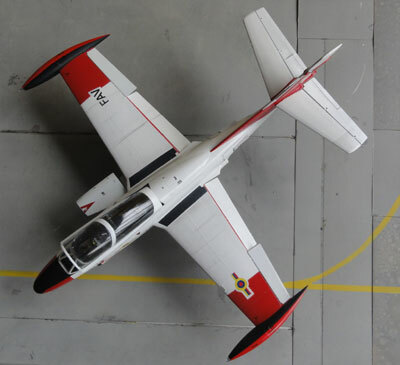 Training and support aircraft were also Jet Provosts and later the T-2 Buckeye and various helicopters. Later on, also 10 F-16A and 2 F-16B block 15OCU aircraft were put in service. In November 1992 a coup was launched by the FAV general but that failed as some F-16 pilots still supported the existing government and shot down rebellian aircraft. 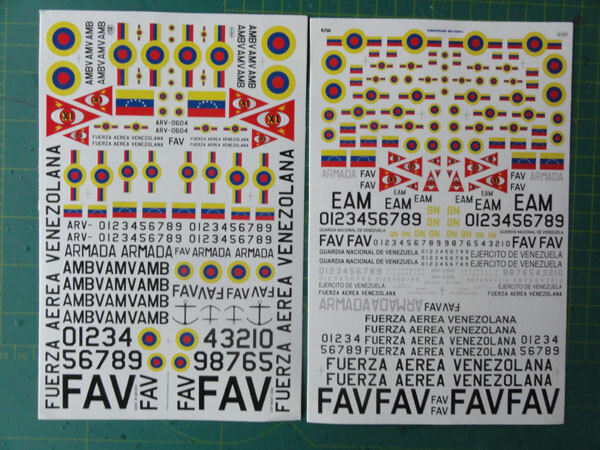 The FAV was renamed Aviacion Militar Venezolana in 2001 and later under the Chavez government "Aviacion Militar Nacional Bolivariana" in honour of the liberator Simon Bolivar. The last decade Russian "socialist" influence became larger and the AMNB purchased Russian aircraft like Sukhoi SU-30 fighters based at Barcelona and El Sombrero. 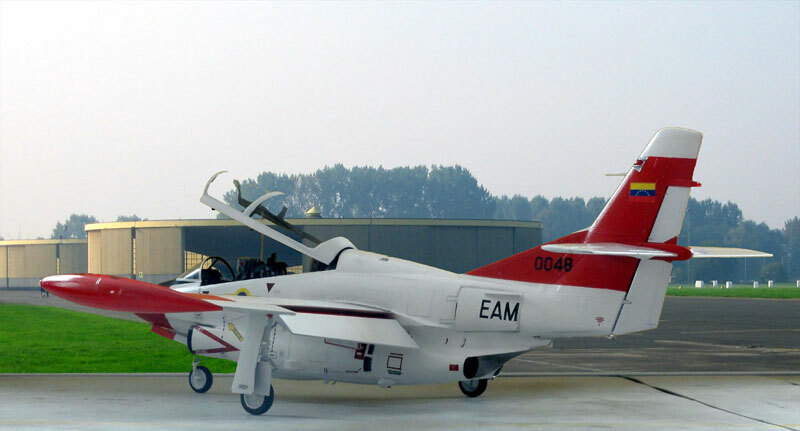 Also Chinese K-8 trainers are used based at mainly Barquisimeto. Currently the country has large political and economic problems.